It's cold out, MInnesota winter cold, probably snowing a little, there is a fire in the fireplace & all we want is something warm & satisfying for dinner that we can eat in front of it. A thick, stick-to-your-ribs soup would be just the thing. 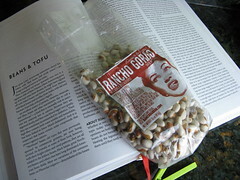 Luckily, there was a ham bone leftover from our pre-New Year's feast & we had lots of beautiful beans from Rancho Gordo that we bought while we were in San Francisco. 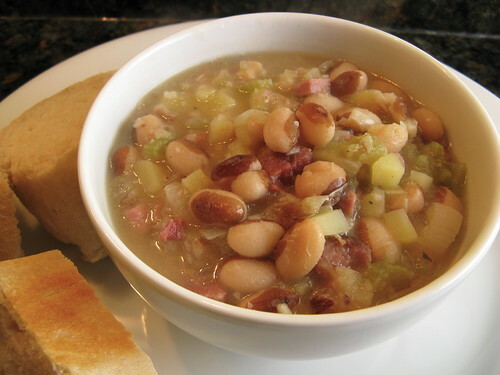 Ah, Ham & Bean Soup, perfection. This soup is pretty much the U.S. Senate Bean Soup from Joy of Cooking. I wanted a real basic, traditional ham & bean soup. We used a ham bone instead of a ham hock. We also added quite a bit more chopped ham because we had it. The only other real change was to add some thyme which just seems to make everything better. Pick through your beans for any small stones then place them in a pot. Boil a kettle of water. Pour the water over the beans until the water is 2-inches over them. Cover & allow to sit for until the beans are double in size, at least 1 hour. Drain. Now the beans are ready to use. 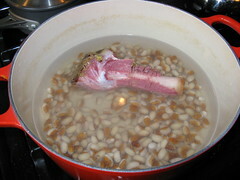 Place the beans, water & ham bone into a large soup pot & bring to a boil. Reduce heat & simmer until the beans are tender about 1 1/2 hours. Remove the ham bone. Cut any meat remaining on it off & dice it. Return the meat to the pot. Add the diced ham, onion, celery, potato, & thyme to the pot. Salt & pepper to taste. Simmer until the potatoes are soft, about 30 minutes. Use a potato masher to gentle mash the soup until it is a little creamy. If I lived in Minnesota, I would have to eat this soup everyday! Soup's on over here too! A big bowl of this would be a fine meal. It is snowing in Utah, so soup is on the menu this week! Yours looks fantastic! Where do you buy ham with the bone still in it? One of my goals this year is to make soup more often so I think this one is going to the top of the list. ah, and there si the ham bone in that yummy soup. I am chilled to the bone right now. I would so love a bowl of that. I am in MN where the thermometer reads 10 degrees at 1pm. I need this soup now! This looks great. And your roast looks fabulous. I made bean soup yesterday too. Looks perfect for a cold day! I agree thyme makes everything better. This is one of my all time favorite soups. I boil a ham hock to make the stock. I cool it in the fridge over night and skim the cold fat off. Ham hocks give it a mild smokey flavor. If it's available I also like to use a smoked jowl. I think your changes sound perfect!